Who’s Going To Emerge in the Ducks Secondary Next Year? Spring practices highlight several key aspects that every team looks forward to. For the Ducks, when this time comes around, they will be replacing pivotal positions that were filled by players who are either off to the NFL or continuing their football career elsewhere. This will allow current players on the football team to prove to their coaches and fellow teammates that they are ready to fill a vacant position. The memories of last season have faded and we now need to focus on what the future will bring. Although there are other important questions that Oregon will need to figure out during spring practices, one under-rated facet will be the Duck secondary. 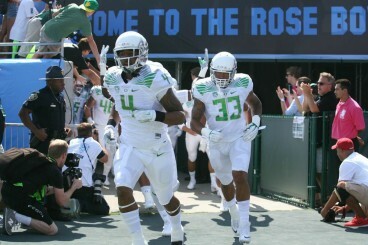 Last season, Oregon’s secondary was put under the command of defensive coordinator Don Pellum. During the beginning of the season, fans and football analysts started to doubt the system that Pellum was using in each game. However, as the players became more familiar with his philosophy and defensive schemes, they performed much more efficiently. Some notable defensive Ducks who won’t be on the secondary next year are Erick Dargan, All-American CB Ifo Ekpre-Olomu, CB Troy Hill, DE Arik Armstead and LB Tony Washington. Last season, Dargan lead the Ducks in tackles and the Pac-12 in interceptions. On top of that, he was a true leaders that younger class men looked up too. There are other crucial defensive Oregon players who were part of the 2014-2015 roster, but these are the Ducks that stood out the most last season. Obviously, the Oregon coaching staff has their hands full in terms of finding viable replacements for these vacant spots on the secondary. Players such as Washington and Dargan served as leaders and were pivotal in tough defensive stretches against great offensive teams. Individuals such as freshman defensive back Chris Seisay have shown their talents on the field last season and will be proving themselves worthy of a starting position during spring practices. Plus, 5-star recruit Canton Kaumatule will certainty be a high-impact player if he can earn the starting role at DE. Last season it was evident that the Ducks weren’t the best of the best in Pac-12 pass defense. However, next season is a new year and a brand new start with a fresh secondary eager to make a statement to Duck and college football fans. Once spring practices are in full swing in April, it will become clear who may step up in the Duck secondary.